Welcome to Diving Heritage !! Karin and Bert Dodde at the famous Musee Du Scaphandres in Espalion, France. 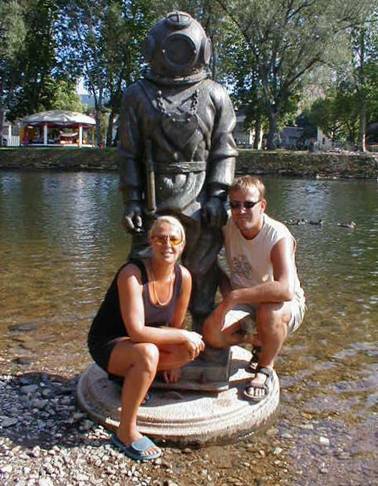 Bert Dodde and his lovely wife, Karin, are two wonderful people who really love diving. They also just happen to be the owners of Europe’s famous DIVING HERITAGE Website: easily the largest and most authoritative forum of its kind in the World. At DIVING HERITAGE, the focus is on underwater technologies, and hardhat diving gear in particular. There, you will find the World’s largest virtual helmet collection, where examples of air hats from every known manufacturer are presented. In their HALL OF FAME, you will find tribute to people like Leon Lyons, Carl Brashear, Roberto Galeazzi, Joe Fontana, and more. The DIVING HERITAGE VIRTUAL HELMET MUSEUM presently contains more than 570 different helmets and bandmasks from all corners of the globe, categorized by National origin. Representing the United States of America are such famous manufacturers as MORSE, MILLER DUNN, DESCO, KIRBY MORGAN, SCHRADER, and others. Most recently, an amateur newcomer was added to this auspicious group in recognition of his artistic contributions to helmet diving community: that guy was me. Personally, I wouldn’t claim to be much more than qualified to scrape barnacles off the bottom of the MORSE DIVING COMPANY barge; but out of the goodness of their hearts Bert and Karin saw fit to include my work alongside that of the real greats who represent the American chapter of diving history, and all I can say is I’m truly humbled. Thank you! DIVING HERITAGE also features monthly articles on noteworthy topics and people. At the time of this writing, the featured article is about the famous diving family of Ivar and Walt Johnsen. In a couple months, Dr. Phil Nuytten will be explaining everything we ever wanted to know about SCUBA diving: and if you know anything about SCUBA, you know he’s certainly qualified to do that. On January 01, 2005, the featured article was about my work with the Disney 20,000 Leagues Diving Suit replicas here at VULCANIA SUBMARINE. Again, I am a little awestruck at having the projects of my humble little backyard shop achieve this kind of recognition in the helmet diving community, but I am also very grateful nonetheless. Again, thank you Bert and Karin! If you are interested in diving technologies, I strongly recommend you visit Bert and Karin’s DIVING HERITAGE WEBSITE: they have been on our LINKS page here at VSC right from the start. On August 16, 2005, we regretfully announced that Bert and Karin Dodde had decided to close the DIVING HERITAGE Website to pursue other things in their lives. We are now happy to announce that DIVING HERITAGE has been kept operational under the new management of Iain MacQuarrie of Cornwall, England. The link to our 20,000 Leagues Diving Gear article is still active, and so is the rest of the DIVING HERITAGE Website. Stop by and check it out!